With its central location on Piccadilly overlooking Green Park, the five-star Athenaeum is a short walk to Buckingham Palace, Hyde Park, Bond Street and the theatre district. Comfortable and luxurious décor adorns the cosy, secluded Garden Room, where Afternoon Tea is taken. In 2012 The Athenaeum was awarded 'Top London Afternoon Tea' by The Tea Guild and in 2013 received 'The Tea Guild special Award of Excellence' in recognition of its outstanding quality and consistently high standards in Afternoon Tea service. It's one of those exquisite things in life that you simply have to do. 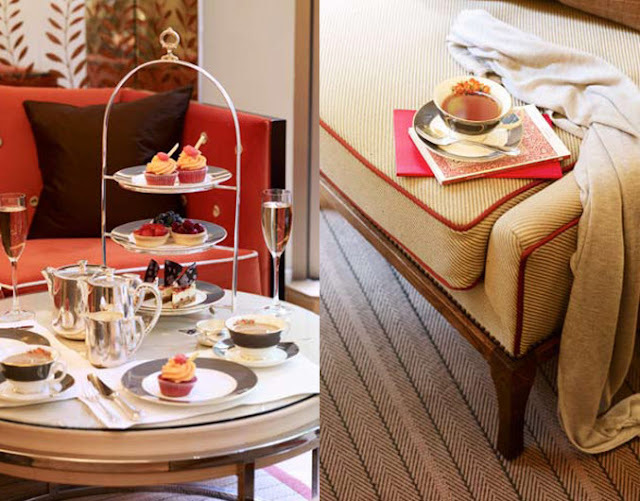 Afternoon Tea in Mayfair…dainty and decadent delicacies… leaf tea in china teacups… pink champagne or Kir Royale… the perfect way to spend the afternoon chatting and relaxing! Crumpets! One so rarely finds crumpets on the menu in the States; is it unusual to find them on a tea menu in London? Afternoon tea is indeed "the perfect way to spend the afternoon chatting and relaxing!"